Studded Bracelet - Kisses & Co.
Hey Coffeeholics! Yes, this was the outfit I wore to the Kashieca and The Body Shop event. I really love the dress that I'm wearing. Its now one of my favorites. I saw this dress at Magarbo - a well known thrift shops that can be seen in malls! I was at The Alphalands one day and saw this and really really liked it. PLUS, it was on sale! It cost Php 100. I know its a bit pricey from the usual ukayukay finds but for me it was worth it. I mean, c'mon! Who can find a decent dress at Php 100 in stores nowadays? hehe. So this dress was definitely a bargain! 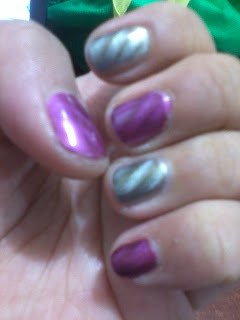 Also, I really wanted to show off my MAGNETIC NAILS. Yep, I had my nails done at THE NAIL XPERT SPA who kindly let me try out their services which I will be blogging about next. I think its pretty cool. It isn't that obvious in the pic but its actually purple and silver. Anyway, I know its been awhile since I was able to post. I'm currently adjusting with my sked at work coz we just started training our students for inter-school competitions and well that means more time at school for me. Would you believe that I'm the "adviser" for the Needle and Threads division of the school? Yes that means I'm "coaching/teaching" students in the (sadly) "dying" art of crochet, knitting, and embroidery. My real expertise (ha.. di naman..kaunti lang!) is crocheting. I've personally joined competitions in crochet (where I won!) when I was in high school. So naturally when I became a teacher, it kinda crossed over and I ended up being appointed as the school. So this is why I really liked the crochet dress. No I didn't do the crochet accent pieces on the dress but I fell in love with its "demureness" ba. Anyway, so what do you think? Would you wear crochet accented outfits? Or crocheted clothes (shawl, coverup, etc?) Or do you own a crocheted article of clothing? Please do share share share!